The regular monthly union meeting is held on the 1st Tuesday of each month at 7:00 PM unless otherwise noted below. Meetings are held at the Barnyard and Carriage House, 754 Totowa Road, Totowa, NJ 07512. Phone: (973) 942-8229. The regular Executive board meeting is held on the 3rd Tuesday of each month at 5:00 PM unless otherwise noted below. 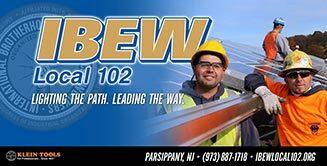 Meetings are held at the Union Office located at IBEW Local 102, 50 Parsippany Road, 2nd Floor, Parsippany, NJ 07054. Due to the holiday the January 2019 General Membership meeting will be held on Wednesday, January 2, 2019. The July 2, 2019 meeting will begin at 4:30 to allow for our annual outing immediately following the meeting. The November 2019 General Membership meeting will be held on Wednesday, November 6th due to Election Day. The November meeting will start at our regular time, 7:00pm.